Jarrow FORMULAS Extra Virgin Coconut Oil from the fresh flesh of the coconut palm fruit, (Cocos nucifera) is unrefined and expeller-pressed in a controlled, indoor environment. This specific process does not utilize any solvents and preserves the volatile compounds responsible for imparting the rich, familiar flavor of coconuts. Coconut oil is a source of medium chain triglycerides (MCTs), such as lauric acid (C-12) and caprylic acid (C-8).Coconut oil is stable even during long periods of storage. Because its melting point is 75-76° F, coconut oil can be used in both liquid or solid forms for cooking and baking. Coconut oil is stable even during long periods of storage. Because its melting point is 75-76° F, coconut oil can be used in both liquid or solid forms, making it ideal for cooking and baking. Other Ingredients: 100% Unrefined Expeller Pressed, Organic, Extra Virgin Coconut Oil. Josh "Best tasting coconut oil"
From all the other coconut oils that I have tried before this is the only one that I did not find funny tasting. This oil has a very light actual coconut flavor that I love to add to everything and use it every mornign with my scrambled eggs. I originally bough this for my hair and it made it feel really light and great smelling. Then I read reviews and started using it when I cooked as well. This stuff works great with the whole kitchen. Highly recommend it. Sarah "Must have in the kitchen"
This stuff is really healthy. Has a mild taste and most importantly it workts great for your skin, hair, and body. Coconut oil has a lot of benefits and I decided to try the oil and find out for myself. All those talks about coconut oil are real. It really does work wonders for such a natural product. What is the complete percentage fatty acid profile for your coconut oils? How do the two versions of your coconut oil differ in the way they are manufactured? Extra Virgin (or Virgin) Organic Coconut Oil is the oil that is derived from fresh coconut flesh of fresh coconut fruit. The coconut meat is processed within 4 hours after fresh coconut meat is obtained. The names “Extra Virgin” and “Virgin” can be used interchangeably. There is very little oxidation or contamination during the processing of extra virgin coconut oil. 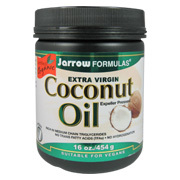 Jarrow Formulas’ Extra Virgin Coconut Oil is cold pressed. The flesh undergoes drying indoors at low heat (80oF) for two hours before pressing to reduce the water content in order to prevent hydrolytic rancidity. With this method, the volatile compounds that impart the familiar coconut flavor are preserved, resulting in that familiar, fresh coconut flavor. Is your coconut oil “refined” or “unrefined”? Our Extra Virgin Organic Coconut oil is unrefined; the Regular Organic Coconut Oil is refined. Extra Virgin Coconut Oil - is shipped in a discrete, unmarked package. Orders are processed immediately and usually take about 3 to 5 working days to be received. We do ask that you try it for 2 to 3 weeks to feel the full effects. Any information received is used only for order processing and shipping purposes. Your information, such as e-mail address, will never be disclosed to a third party.